James Allen DeBruyn, age 65, of Byron Center, passed away on Sunday, June 24, 2018. 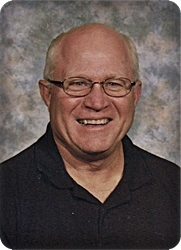 Jim was a beloved teacher and coach. His brother, Jon, preceded him in death. He will be lovingly remembered by his wife of 46 years, Pamela; his children, Jamie (Amy) DeBruyn, Aaron (Joy) DeBruyn, Adam (Kim) DeBruyn, Jordan (Elizabeth) DeBruyn; grandchildren, Joseph, Emma, Noah, Ahnalie, Astoria, Carson, Cameron, Silas, Alden; brother and sisters, Jay (Gwen) DeBruyn, Jeanne (Ray) Moore, Joy (Doug) Smook; and sister-in-law, Mae DeBruyn. The family will greet visitors on Friday from 2 - 4 and 6 - 8 pm at Stroo Funeral Home. The funeral service will be held at 11 am Saturday, June 30, at Neland Avenue Christian Reformed Church, 940 Neland Ave. SE, with Rev. Duane Kelderman officiating, Interment in Winchester Cemetery. Memorial contributions may be made to Faith Hospice.